Cracked heels are often a sign of neglected foot care rather than dryness or lack of moisturizing. They can occur in both hot and cold weather and are more common in women, but regularly occur in men who are less inclined to look after their feet. Medically, cracked heels are referred to as heel fissures, which are linear breaks or cracks in the surface of the epidermis (callus) at the back of the heel. 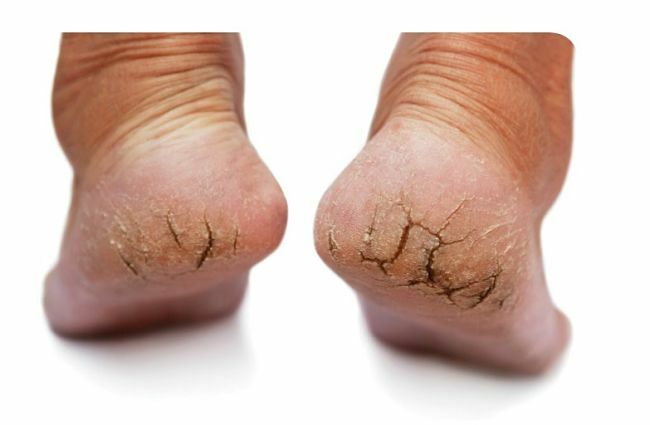 Cracked heels are not generally harmful, but can become painful and cause infections when the cracks or fissures deepen and causes bleeding, inflammation and infections in the skin and tissues below the callus. The cracks and breaks in the outer hard skin layer allow the callus plates between the cracks to flex This flexing movement causes breaks in the tissues below the epidermis. The cracks mostly start in the outer layer of dead skin on the surface of the callus. The key to treatment and prevention is to soften and physically or chemically remove this outer layer if the cracks are long and wide using a foot scraper, emery board or file tool. Regular attention to the heels to keep them soft and supple is required to prevent the cracks from re-occurring. The cracks are also very unsightly and should be treated as soon as they are noticed. They are relatively easy to fix and treat when minor, but are hard to repair when deep and infected. This article describes the causes or cracked heels, home remedies and how to prevent them recurring. Flaky or red patches - This is one of the first warning signs of the risk of dry cracked heels. Fine lines and cracks over the heel - The cracks often begin as tiny very shallow cracks that can quickly deepen and length. When they occur rub off the outer layer of dry skin and apply a moisturizing cream. Dry and peeling skin - Peeling is a definite sign that the skin is dry and likely to crack. Dry skin is also a sign that the dead outer layer of the callus need to be removed and moisturized. 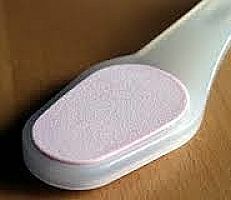 Back-open sandals or shoes allowing the heel flex increases the possibility of cracking. Various disease and disorders - Eczema, Athlete’s foot, Psoriasis, Thyroid disease and Diabetes and some skin conditions. The first step is to exfoliate around the heels to reduce the thickness of the callus - Use a scraper, pumice stone, emery board or heel filing device on your feet to eliminate rough dry skin and reduce the thickness of the heel callus. Rubbing the scraper surface in soap helps. If your feet are very rough and the callus is hard, soak them in a mixture of warm water and milk for about 30 minutes before showering. This will often remove many of the surface cracks and make the deeper ones much easier to treat. Doing this in a minor way every day is a good prevention strategy. Massage your heels with sesame oil before going to bed to soften the callus and skin around the heel (wear socks). Mix rosewater with a little glycerin apply to the heels daily. This soothes and repairs cracked heels. Take a bowl of water, add the juice of one lemon and soak your feet and then rub with pumice stone and soap. Massage your feet with coconut oil every night. Mix equal volumes of apple cider vinegar and olive oil and store in a glass jar. Rub into your feet each night and wear socks to keep the solution working. Mix lemon juice and papaya and apply it on the cracked heels for 20 minutes and wash off. To soften your feet prior to scraping soak your feet in warm salty water. Take a very ripe banana. Mash it, and apply to the affected areas and leave it on for about 15 minutes. Glycerine is a natural moisturiser that hastens the repair of cracked heels. Mix one part glycerine, two parts of rose water, one part lemon juice and rub into the heels. Make sure your shoes fit properly. Moisturize your feet regularly, especially the heels. Zinc and omega 3 deficiencies can cause cracked heels, so make sure you don't have these deficiencies. Start a daily regime of checking, scraping and moisturizing you heels using a mixture of 1 teaspoon of honey and 1/2 teaspoon of olive oil.